Helene Van Kley reviews the school day schedule at the New Groningen Schoolhouse in Holland Township. 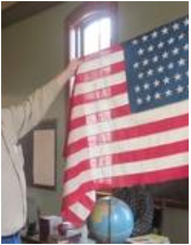 Local historian Kit Karsten displays a 46-star American flag at the New Groningen Schoolhouse in Holland Township. Lifelong Zeeland resident Elaine (Veneklasen) Van Zoeren remembers so many little things, including the time she accidentally spilled the contents of an inkwell on a student sitting by her. The memories all came rushing back for Van Zoeren, who celebrated her 90th birthday on Valentine’s Day. 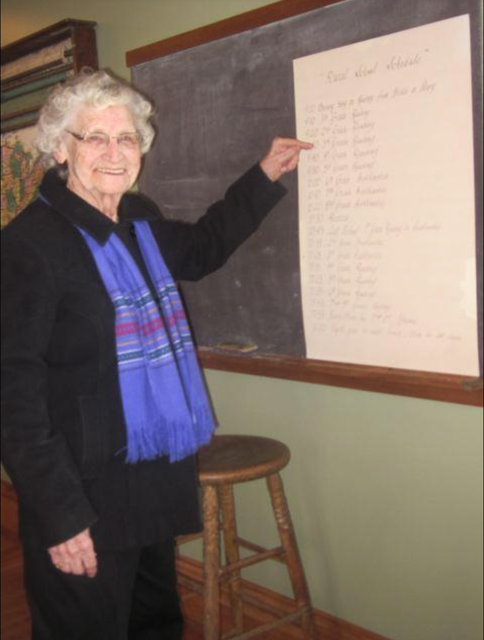 She he admired the surroundings of the renovated New Groningen Schoolhouse in Holland Township during a Feb. 18 public reception unveiling the $500,000 project recently completed under direction of the Zeeland Historical Society. Van Zoeren attended the two-room schoolhouse at 10537 Paw Paw Drive from 1926-1930 and graduated from Zeeland High School in 1939. One of her good friends then — and remaining so until this day — is Helene (Van Kley) Schaap, who will turn 90 this year and attended New Groningen from 1927-1931 and graduated from Zeeland High School in 1940. The pair said school traditions included having a daily devotion and singing hymns together. And, as luck had it for the students, “everyone got B’s,” Van Zoeren said. The pair recalled the schoolhouse had only outdoor toilet facilities until one Christmas vacation during which workers installed the indoor variety. The renovation results received high marks from the former school students, who helped project leaders identify the original traits of the schoolhouse and classroom. “They did a good job with it — it’s very pretty,” Schaap said. “They really did things like match the color themes and old layouts,” Van Zoeren said. Van Zoeren’s grandparents started the Veneklasen brickyard company. Those bricks were used in buildings throughout the area, including the schoolhouse. The completed renovation includes the 30-seat Veneklasen schoolroom. Visitors also were able to view the Schoemaker Room, a meeting and gathering area that can be serviced by an adjacent kitchen and is available on a rental basis for business, community and family events. Young visitors also enjoyed the old schoolhouse atmosphere. Todd and Karen Kamphuis of Zeeland attended the event with their four children, Brandon, 10, Keegan, 7, Trevor, 5, and Aubree, 9. “They all go to the current New Groningen school and it’s really neat for them to get a little bit of history. They all like watching ‘Little House on the Prairie’ and they can see what an old schoolhouse really looked like,” said Karen Kamphuis as her children sat in the historic replicated schoolroom desks. The current school is on property adjacent to the old school. “They can see how the school started and they got to ring the school bell,” Kamphuis added. The rope pulling that sets off the original working historic school bell for the facility also attracted the interest of 4-year-old Bennett Silva, who came to the event with his grandmother Mary Bolles. Event organizers were pleased with the turnout that attracted dozens of visitors, including several who were lined up at the door before the school doors opened. “We have several generations coming through, including some people who lived here previously as a young family and returned to see it,” said historical society member and local historian Kit Karsten. “We love it when people visit and find old pictures of when they went here,” said Suzy Frederick, curator of the Dekker Huis/Zeeland Historical Museum in downtown Zeeland, which previously housed the schoolroom desk collection. Frederick encouraged area residents to rent the facility for family, community and business events. “We really need them to do that so we can keep this all self-funded,” she said. The 3,000-square-foot schoolhouse dated back to 1881, when it was used as a rural education facility for residents in the Zeeland-Holland Township area. It served that purpose for more than 70 years before closing in 1952. At that time the area became part of the Zeeland school district.